John Isner is now the No. 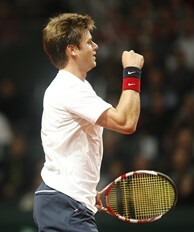 1 singles player for the U.S.
Ryan Harrison is the No. 2 singles player against France. ROQUEBRUNE-CAP-MARTIN, France – Ryan Harrison was driving home from the golf course last Friday when he received a phone call from U.S. Davis Cup Captain Jim Courier. Courier was calling to invite Harrison to replace Mardy Fish on his team’s roster for this week’s quarterfinal tie against France in Monte Carlo, after Fish had a minor health scare and doctors recommended he have a few days rest and not make the trip. Yet Courier hardly had to say the words before Harrison said "yes" and became the No. 2 singles player on the U.S. team, joining John Isner and Bob and Mike Bryan, who will face a French team that also had a lineup change, with world No. 13 Gilles Simon replacing the injured Gaël Monfils this week. Although the roles and opponents this week have changed for Isner, Harrison and possibly the Bryans, everyone’s focus and mentality is still the same: Bringing their best tennis to defeat France and advance to the semifinals. For Harrison, the world No. 66, this will be his first time playing a live Davis Cup match when he takes the court on Friday, having secured his first Davis Cup victory in February in the U.S.’s 5-0 victory over Switzerland in a dead rubber. The whole team was concerned for Fish’s health but is happy to have Harrison filling his role and know Fish will be back on court again soon. "He knew I was going to accept before he made the phone call," Harrison, 19, said of Courier’s invitation. "Fortunately for me, I started practicing early after Miami and I was already planning on playing Houston so I was training to be on the clay. It worked well with my preparation when I had to change to come here. I was excited at the opportunity. "It is very tough that Mardy is not able to make it and we are all disappointed that he is not in the greatest health right now," he added. "But I think he will be ready to go soon and we are really hopeful that he will be ready for Houston." Harrison added he grew up in Louisiana playing on local clay courts and feels extremely good on the surface. "A lot of factors went into my choice," Courier said of picking Fish’s replacement." Ryan was the best man for the job. That is why he is here." Isner now moves up to the No. 1 singles spot without Fish, a position he has not been in for the U.S. Davis Cup Team since his first tie back in 2010 against Serbia. He has come a long way as a player since then, having recently reached his career-high ranking of No. 10 in the world and currently sits at No. 11. His opponent for Friday’s singles matches changes as well, as instead of facing France’s No. 1 singles player - world No. 6 Jo-Wilfried Tsonga - he will most likely play Simon, although the official lineup for the weekend will not be revealed until Thursday’s draw ceremony. Isner is 2-0 in his career against Simon, the latest a recent three-set victory in Indian Wells (where Simon defeated Harrison along the way) but the two have never played on clay. Against Tsonga, he is 1-1, although the two have never met on clay, either. Whether it is Tsonga or Simon, No. 1 or No. 2, his focus remains the same and he feels very comfortable on the clay. "No, I don’t think so," said Isner about whether being No. 1 changes his mindset." I went into this tie thinking I was going to be No. 2 but now obviously I am the No.1. It doesn’t change anything, I have to go out there Friday and try to win a match for us, no matter who I am playing. For me, it is still the same. I am not thinking any differently." While the lineup for the U.S. team is no secret, how French captain Guy Forget configures his team could be up in the air for both singles and doubles. Simon has had a back problem, but Forget said he had an MRI that showed nothing and is feeling fine, though he has yet to arrive in Monte Carlo. Forget said he chose Simon over Gasquet to replace Monfils because Gasquet has a sore elbow and might not be able to play five sets. Michael Llodra and Julien Benneteau round out the French team and could make up the doubles team to face the world No. 1 Bryans. Captains have the option to change nominations before the start of play Saturday as well. Bob Bryan is making his return to Davis Cup after missing the first round due to the recent birth of his daughter. The Bryans have been nothing short of clutch in their Davis Cup careers, with a 19-2 record together. The court at the Monte Carlo Country Club is one they have played - and won – on many times as it is also the host of the ATP Monte Carlo Rolex Masters tournament, where they won the title last year. They also know their opponents well, Llodra is the world No. 5 in doubles, and know as usual, they will have to bring their best tennis no matter what the score is come the doubles rubber Saturday. "We like playing here. 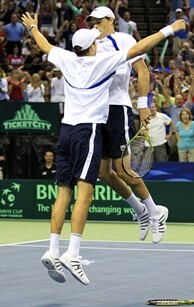 We are pretty comfortable; we have been playing here for 10 years," Mike Bryan said. "I think we have played some of our best tennis on this center court. We played Llodra for Grand Slam titles, we played him in the bronze medal match (at the 2008 Olympics). We have played him at least 20 times, he has beaten us a bunch, and we have beaten him a bunch so we have to play well."